I recently spent a pleasant afternoon helping to judge the annual British Birds and British Trust for Ornithology’s Best Bird Book of the Year competition. Three of the books to catch the judges’ attention focused largely on an individual species and all three highlighted some of challenges faced by those striving to maintain our bird populations. The highly readable Cuckoo by Nick Davies emerged as the winning book. This is an engaging and enthralling account of the unusual breeding behaviour of this enigmatic bird. It's an uplifting book to read but it ends on a melancholy note. Only a handful of cuckoos have returned to the author’s study site at Wicken Fen in Cambridgeshire in recent springs, reflecting the dramatic national decline in numbers. I already cared about the plight of the cuckoo. But the strength of those feelings were greatly enhanced by the time I reached the end of the book, having been immersed in the author’s life-long quest to understand what makes it tick and his infectious enthusiasm and affection for it. The book vividly describes what we know about the cuckoo and, in doing so, it provides a powerful argument for its conservation. The more we learn about the natural world, its colour and its complexities, the more we realise just how much we stand to lose. Mark Avery’s Inglorious is a very different book but also focuses attention on a bird in decline. He offers his personal take on the management of our uplands for grouse shooting and its impact on the threatened hen harrier (among wider issues). He makes reference to the draft Defra Action Plan for hen harriers (now published – see here) but has his own proposed solution to the problem. Whilst he certainly won’t convince everyone, few will read this book and be left in any doubt as to the scale of the challenge ahead. The Life of Buzzards by Peter Dare deals with another medium-sized bird of prey and another bird whose predatory habits can cause controversy. He began studying the buzzard on Dartmoor back in the 1950s when it was very much less common and widespread than it is today. It is now a regular sight in every English county and a bird that even manages to brighten-up my trips around the M25, hunched on its lamp-post lookouts, eyes fixed on the ground below as the traffic crawls by. The book provides an excellent overview of the buzzard’s ecology and includes a thoughtful summary of the vexed issue of gamebird predation. These three books encompass the huge variation in the recent fortunes of birds in England. 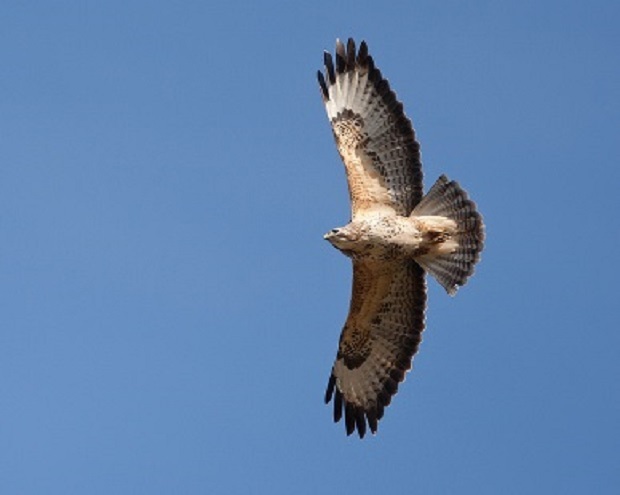 The buzzard has made a dramatic recovery and is now, once again, a common and familiar part of our landscapes. The cuckoo remains reasonably common and widespread for the moment but is in steep decline. And the hen harrier is on the very edge of extinction as a breeding bird in England. It will be a real challenge to save it. Of concern also is the decline in some of our more "common" (so-called) birds like the starling and sparrow. Starlings appear to be in a lot of difficulty in many areas as do sparrows. One problem is the decline in back and front gardens which appears to be a growing natioanal problem. So many gardens are being paved over or have less and less vegetation.